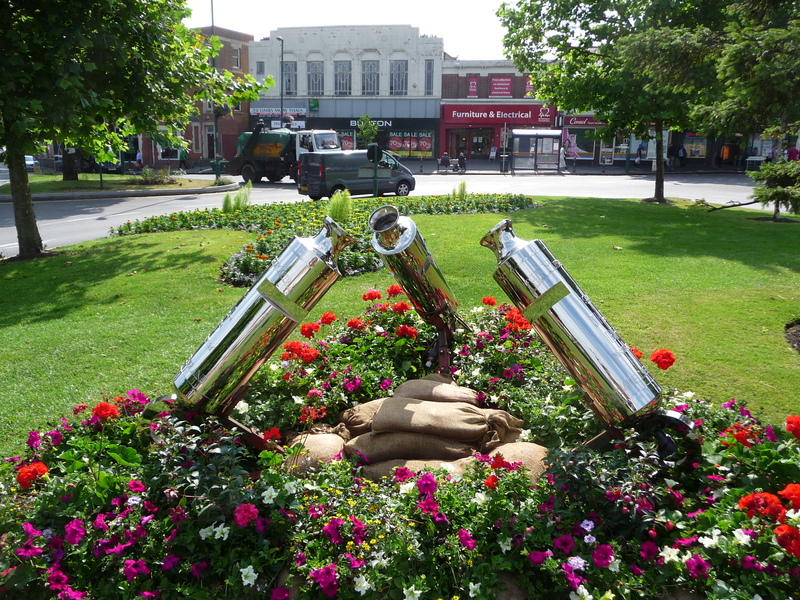 Many locals and people passing through the village may have been struck by the display of whistles on the central island in Acocks Green. Yes they are whistles! A floral display was designed and produced by Birmingham City Council for this year’s entry into the Chelsea Flower Show. The design represented the contribution that Birmingham made to the First World War. As it is the centenary of the beginning of the WWI, it was felt this would be a poignant display. The whistles were used by advancing troops as a signal to their fellow soldiers. Acme Whistles are still made in Birmingham and have a long history, including being used on the Titanic and are the whistle of choice for football referees. Also included in the orginal display were other remembrances of the First World War – including a BSA folding bicycle, a train that carried the troops to the war, a biplane, horses, carrier pigeons and dogs, all of which played vital roles in the war effort. The different elements have now been separated and many appear in the current Birmingham City Centre’s floral trail. We are lucky in Acocks Green to have part of this award-winning and poignant display. This entry was posted in local history, News and tagged acme, Acocks Green, Birmingham City Council, Chelsea Flower Show, floral display, Floral trail, whistles. Bookmark the permalink. 5 Responses to Why Whistles? They look great and are really eyecatching. Thanks so much to the Bloom team. They are also a fitting reminder for us all of the centenary of the Great War. How long do we get to keep them for?! Hello Lucy, thanks for the positive comments. Not sure how long they are there for, hopefully til September, if anyone knows more details please get in touch. Thanks for the explanation – I was wondering….